Keep your restaurant or deli ready with this Durable Packaging SW-15 15" x 10 3/4" interfolded deli wrap wax paper. Interfolded wax paper products like these sheets are a great way to save time and improve efficiency in your business. Their pre-cut, interfolded design gives you a uniform sheet each time, and makes it easy to grab the next one for fast service. They are great for a variety of applications! This paper is all that is needed to wrap anything. It is wide enough and firm in quality. Does not rip. I recommend this to all who do sandwiches, cakes, any wrapping needs for dry products. DELI PACKAGING IS GREAT FOR MULTI USES. GREAT SIZE FOR SANDWICHES. KEEPS BREAD FROM GETTING SOGGY. GREAT AS A FOOD BASKET LINER. WRAP LEFTOVERS WITH IT. SAVES ON PLASTIC. This bigger size wrap is great for a full size sandwich. Covers a sandwich well and is easy to cut through with a knife. Keeps food from sticking. I use this huge wax paper for when I box up product in the big 8x8 bakery boxes it fits it so nicely and keeps my cinnamon rolls from touching the brown box bottom. This deli wrap is a must have! The size is perfect for wrapping sandwiches, rolling dough, or even using as a liner. The paper is good quality; it doesn’t rip or tear easily and the price is unbeatable! I use these as another layer for serving food on dishes and trays. They are good and inexpensive. It makes cleaning up much faster and easier. I buy all my wax paper from here now, it is the same great items at a much better price then any food supplier..... I would recommend any other business owners do the same, it will save you a lot of money over time. This box of waxed deli paper is a great value. These are large sheets perfect for wrapping sandwiches or lining food baskets. Convenient dispenser boxes are great. These large sheets of deli wrap paper are perfect for any restaurant. Convenient dispenser box allows you to pull the sheets out one at a time. Perfect for lining French fry baskets or wrapping up sandwiches. Excellent deli paper, big box, half the cost of my local distributor, very pleased. Box arrived a little banged up, but did not affect contents. I do not own a restaurant, and I use these literally everyday at home! They are great for lunches, snacks, and food preparation. I wrap my sandwiches in these before putting them in a sandwich bag, which eliminates the need for dirtying plates and such. GREAT DEAL! This is a great product. We use it constantly daily to wrap a lot of our to go food items with, which alleviates the higher cost of containers, boxes, etc. It can be used in so many ways whether for dining in orders or take out. These are used to wrap bagels, wraps and much more they are working out to be the correct side and making things easy to wrap. We use this as a counter liner for just about everything that we do. We use it to line our baskets also that we serve our sandwiches in. Love the compact box and inter folded layout - makes for frustration free use when you're deep into service. Great product for wrapping sandwiches, etc. We used this deli paper to make a wrap and sell at a local summer event. The paper held up and worked perfect. We had some juices leak out of the wrap and they still held up great. We recommend and will reorder more for next year! Items arrived in timely manner, great for sandwiches, snacks, and microwave use, also used for placing fried foods on and wrapping up meat to prepare for freezing, very pleased with purchase, highly recommend to others. This is really nice wax paper in a handy dispenser. We use this wax paper in our baked goods' display case. It' great for making things look nice, clean and simple. May switch to the unbleached deli paper, though, just for environmental reasons. But this is a great product at a great price. Bit off sized for our purpose, and not happy when used with BLTs as the hat bread creates a moist sandwich when wrapped in this deli wrap. This wax paper is really handy. We use it for a multitude of tasks - line aluminum pans for scooped dough, layering cookies before packaging, working with dough and so on. It is easy to grab a sheet, light, flexible and yet durable. Not just for a deli! I can't say enough about these wax sheets they are awesome. Great size and they last forever, I use them in crafts, or in the kitchen when I have something small and o don't want to use a plate. I dehydrate flowers and I use them too. Great price and quality. We use these all of the time to line our to go boxes. We also have been using these to line our baskets for appetizers. Good deli wrap wax paper. Not much else to say. Good stuff. Shipping is always fast and priced right. I will definitely buy again. Thank you. 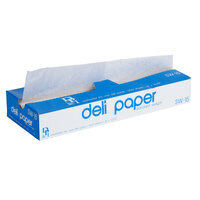 Love this wax paper and use it everyday in our bakery / deli. We use it to line our sandwich baskets as well as our bakery boxes. Perfect paper for rolling out cookie dough. It's a great size so it can be stacked on a sheet pan and frozen. Also great for packaging cookies. After trying many different brands, I am happy to have finally found a economical yet durable wax paper. Perfect for packaging wraps with minimal liquid seepage. These wax paper sheets are great to use when baking (such as when rolling cookie dough) or to line packages or boxes of baked goods. Just what you need when you have jumbo stuff to wrap. The only downside is that it isn't easy to pierce them with sandwich picks, but that's probably got as much to do with my wrap skills as the paper itself. I will definitely buy these again as I need them. These Jumbo sized wax paper sheets are perfect for me! I use them to layer inside a 10x14" box when I fill them with my hand decorated sugar cookies. It keeps them from getting crumbs or butter grease on one another. They are also great for putting on the counter top to set a spatula on so you don't get frosting all over the place. These are what I use to put between cookies when freezing, meat patties for storing or in the bottom of boxes I store food in. These also work well to separate cheese slices on deli trays or to wrap up a bagel sandwich. I sometimes line popcorn bowls so I can just dispose of these when done--no washing the dish. Very handy for so many uses. I love these papers. I use them for everything from drying herbs, to lining a pan to flash freeze vegetables, to reheating cooked bacon... to wrapping chunks of meat or fish before freezing. My husband uses then on the counter top when he makes a sandwich. Lots cheaper than paper towels or napkins. Thanks! Great wrap paper, not too thick, not too thick. And it's also great for other uses. We also use this as baking liner when in a pinch for foil or wax paper. This is a Good Quality Wax Paper, we use these for wrapping sandwiches and lining pizza boxes and bread baskets. Can't beat the value from WebstaurantStore. I love the size of these deli paper. You can use them to wrap large sandwiches and if you use them to line the bread baskets, you can tear into to and get two sheets out of one. Perfect size for wrapping sandwiches and wraps. Also strong enough, will not tear while wrapping. Size and price are very convenient. good for small or large sandwiches. These are a great value for the money! It is a very high quality product! We like the convenient pop up dispenser and how easy these are to work with. This wrap does an excellent job! Our church sells fish sandwiches out of a concession wagon, and the 15" wraps are just the right size to wrap each sandwich securely. The hot sandwich does not turn soggy as it waits in a styrofoam cooler until sale time.